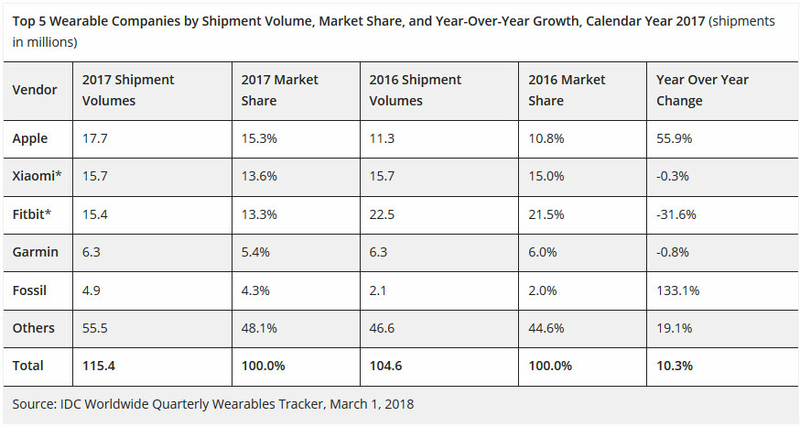 Unlike the smartphone market, which has seen a decline in shipments, total deliveries in the wearables market set a quarterly record during Q4, and an annual record during 2017. According to IDC, during the fourth quarter of 2017 shipments of wearable devices rose 7.7% from 35.2 million units to a record 37.9 million. For all of 2017, a record 115.4 million wearables shipped, up a healthy 10.3% from 2016's total of 104.6 million units delivered. IDC's data shows that for the first time ever, the Apple Watch was the wearables leader during the quarter. Led by the Series 3 Cellular model, the company shipped 8 million timepieces from October through December for a 21% market share. That was nearly a 58% year-over-year gain from Q4 2016 when Apple held 14.4% of the wearables market. In second place with 5.4 million wearables delivered during the fourth quarter was Fitbit. A 17.3% drop in shipments took the company's market share down from a leading 18.5% in 2016, to 14.2% last year. Xiaomi dropped from second to third during the holiday quarter, while shipping 4.9 million units for a 13% share of the market. The biggest year-over-year jump came from Huawei. The latter nearly doubled its deliveries of wearable devices to 1.6 million units, good enough for a 4.3% slice of the wearables pie. That put the company fifth on the Q4 list, behind Garmin's 6.5% share. For all of 2017, the Apple Watch had 17.7 million units shipped, a 56% jump over 2016's total. Apple owned a 15.3% share of the wearables market last year, up from the 10.8% it had in 2016. 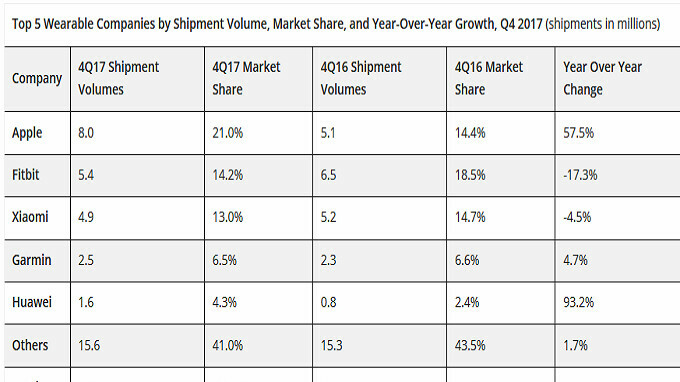 Xiaomi was in second place, exactly where it was in 2016. The firm's market share of 13.6% for 2017 was a small decline from the 15% slice of the market it had the year before. It was a tough year for Fitbit, which dropped to third place from first during 2017. A 32% year-over-year decline in shipments took Fitbit's share from 21.5% in 2016 to 13.3% last year. The company was busy concentrating on the distribution of its Ionic smartwatch, and development of apps for Fitbit OS. In fourth place for 2017 was Garmin with 5.4% of the market, followed by Fossil. The latter saw the number of deliveries jump by 133% to 4.9 million last year from 2.1 million the year before. Market share soared from 2% to 4.3%. I think apple watch is really good. Because i have used android wear and apple watch both. Apple watch has better integration and much more features. I have both and Apple wins easily because of application support. The gear S3 is nice also I like the different watch faces but over all the Apple is more useful. First of all if all you have is iPhone then you multiple options. But the Apple watch doesn't support Android. So clearly you are an iPhone guy. If you switch back and forth than Android Wear is better. For me what makes the Apple Watch the best was when Apple Music came to the watch. Apple Watch plus Apple Music plus AirPods is an awesome combo! Honestly I think Samsung could help and benefit from making a Android Wear watch! Be nice have the best tag team duo Android and Samsung back together! What this shows is Apple had a plan and they are executing it year after year. That has always been one Apple's of strength. Everyone else (Google included) looks like they did not have a plan past year one. When Google did not hit their home run on their first at bat with android wear they did not know where to go next and just drop it. That is Google's biggest problem right there when it comes to non web services. Google's home run would be Samsung's brand on their software unfortunately Samsung is the Nightwing of oems and want to be their own entity. See these watches every where now. With iPhone and iPad it took 3 generations before device was ready for mass market, Apple Watch starting to be there now too. I'm surprised how often when i see someone wearing wristwatch they have Apple Watch. First gen Apple watch was nothing special, sort of a joke against Samsung at the time, but they've made the changes necessary to have a good enough product to take over the market. And because it's Apple, they have more 3rd party developer support, so I am in no way shocked they became number 1. This isn’t shocking, to be honest. Good for Apple, nonetheless. I would have thought samsung would be on the list. That is a big "other" category though. Gave my Samsung Gear S3 to my brother in law. Just got my Apple Watch last night, love it. Umm...Does Samsung even have any Android wear devices? Yes the Samsung Gear Live.